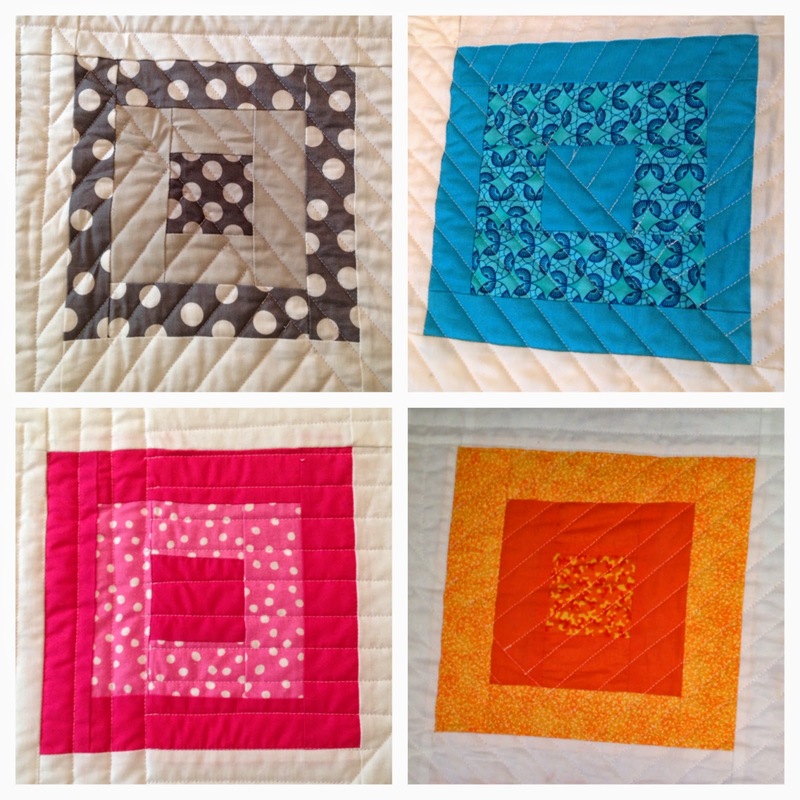 The Covered in Threads guild challenge for 2014 was a log cabin quilt. 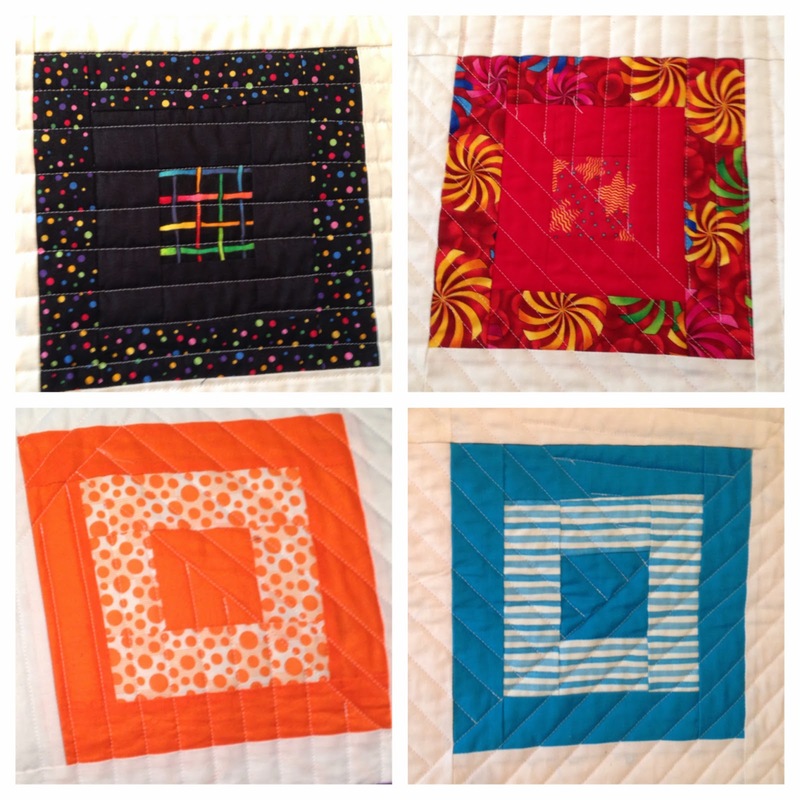 I love log cabin quilts but I don't particularly love making them. They always seem to take longer to construct than I think they should! I decided to make an off center block and after laying them out a few ways, I went with this following pattern because I felt like it gave this traditional block a circular effect. I used a circular pattern to quilt it. I brought this quilt to our winter retreat for show and tell. I wasn't the only one. A few others had finished their log cabins for show and tell too! 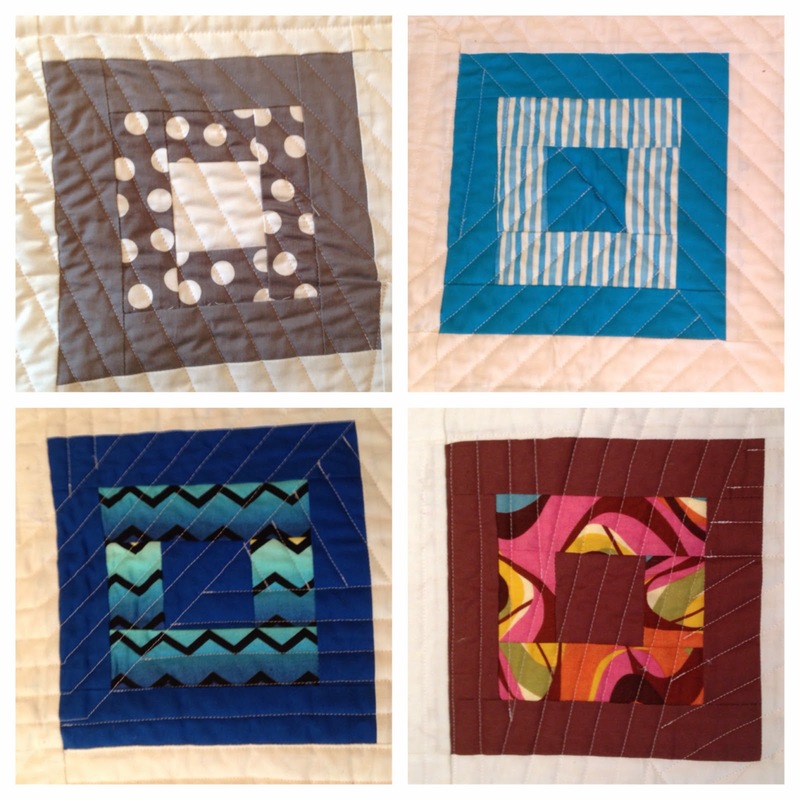 The 2015 challenge is a tessellation quilt. Several of us had to look up the meaning of tessellation. Labels: I'm officially out of gray and orange scraps. Unfortunately, I forgot to take a photo of the quilt before wrapping it up. But here's a photo of Jake and Kathryn opening the gift. 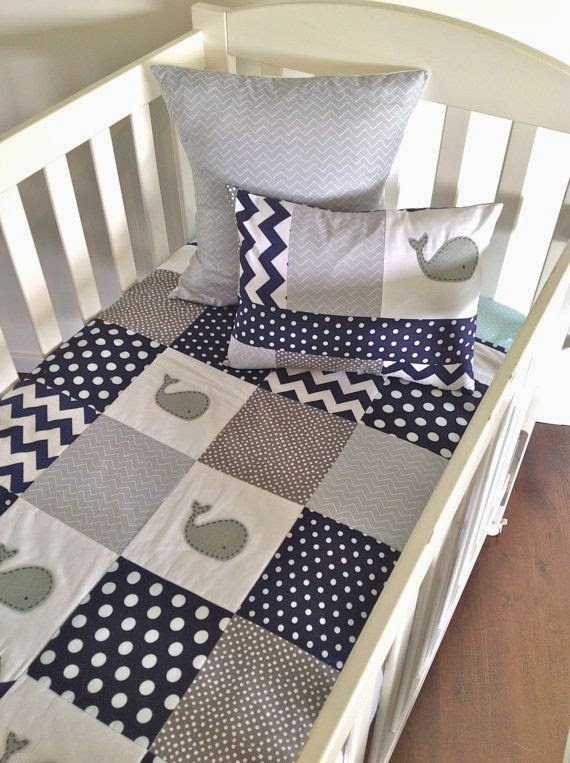 And Kathryn was kind enough to send me a photo of the quilt, ready to go, in the nursery. I CAN'T WAIT TO MEET MY NEPHEW!! Updated to add.... the other day, I saw this fabric at Jo-Ann's. 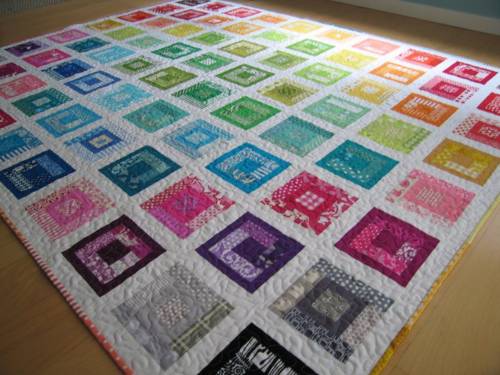 I almost want to redo Kathryn's quilt just so I can add this to it! Well look-ie there, it's another t-shirt. This was a commission project that I made for someone who had collected t-shirts from several diabetes awareness events. I met with the owner when she handed off the t-shirts to me and I asked for her thoughts on what she wanted. 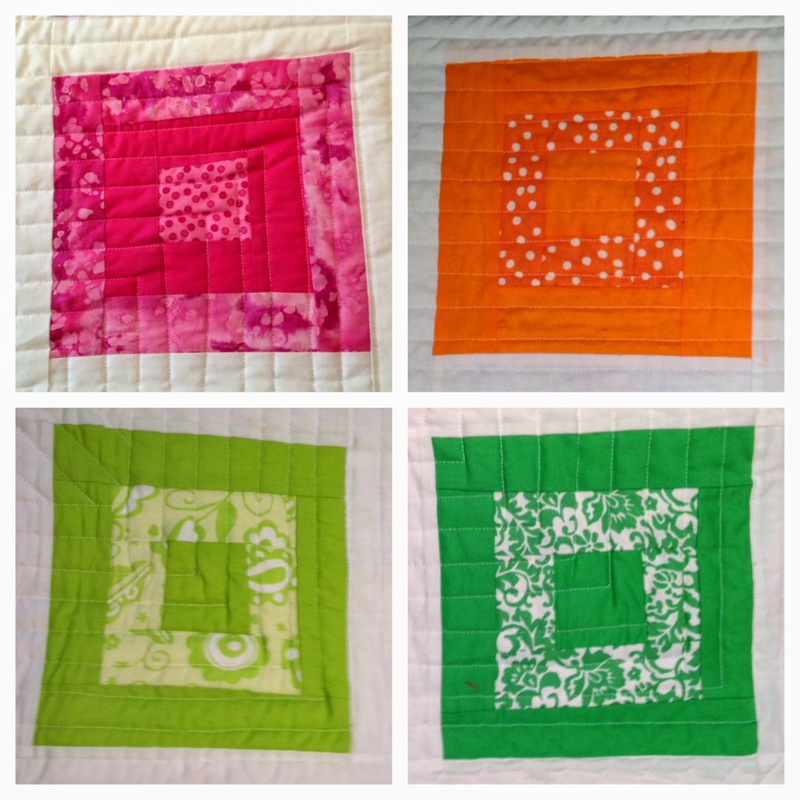 She shared this photo of another quilt that she saw on Pinterest and she asked for something similar with blues, using the front and back of the shirts. 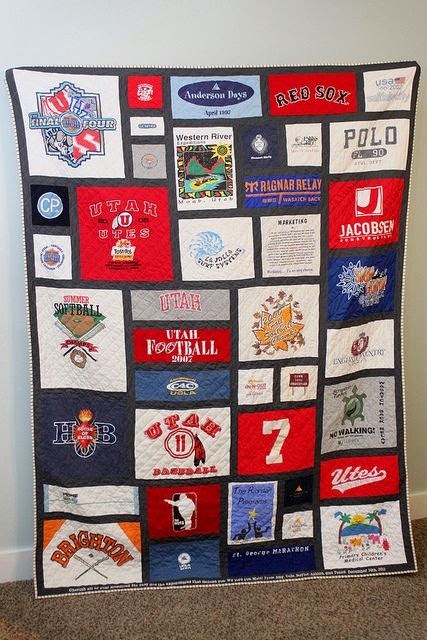 I have to say, I LOVED making this t-shirt quilt. I started by cutting down the shirts and then measuring the graphic of each shirt. Then I drew a diagram to figure out where everything would go. It was a challenge to keep the front and backs of the t-shirt together while factoring in the colors of each shirt. Most of the shirts were gray and white so I wanted to spread out the colors. Cutting the shirts was nerve racking. I would double and triple check the measurements before cutting them. I was paranoid about cutting one too small and throwing off my whole diagram. I loved putting together the blocks. And here is the finished project. I was able to utilize all the shirts and make them fit. I'm so pleased with the outcome. Labels: the owner asked me to make a second t-shirt quilt - SCORE! Another finish for 2014. I'm on a roll! I can't take much credit for this quilt though. It's a baby quilt for my husband's cousin's daughter who is expecting in August. (Did you catch that one?) My mother-in-law pieced and appliqued the top. I layered and quilted it and attached the binding. This lovely quilt is going in the mail tomorrow, just in time for the baby shower (which I can't attend) that is being held in Detroit. 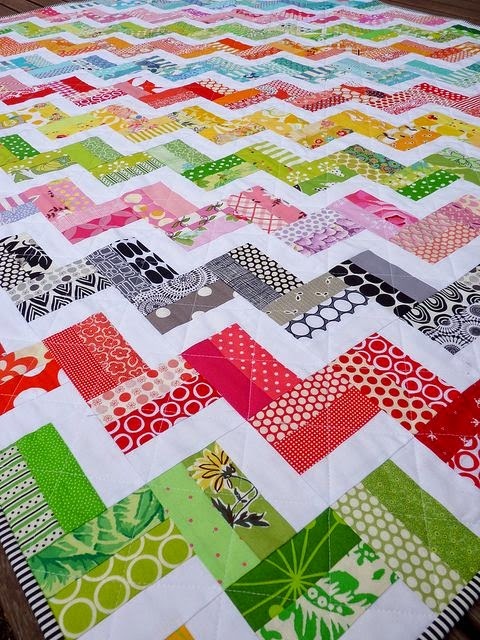 I'm in love with this quilt. It was tough to give away but fortunately, it was for a good cause. My cousin, Aaron, and his lovely fiance, Jenn, are getting married in August so of course, I wanted to make them a lovely creation. I asked Jenn to pick out a color scheme and pattern. She definitely gravitated toward squares within squars. As for colors, she said that they liked blues. I had purchased a fat bundle of awesome Lotta Jansdotter Glimma fabric during a visit to Crimson Tate in the fall so this project was the perfect excuse to cut in to the bundle. Here's a photo on progress. I added several of my own scraps to make this a a bigger quilt.